I have to say I got this one wrong...one more fronts than one. The atmosphere for the game, while not as electric as the small-gym feel at the Palumbo was pretty good - even though the venue was probably only about 60% full. The fans on both sides were into it and it very much had the feel of a big game, which it really wasn't. 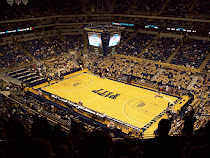 Pitt played horrific in the first half, but shook it off to win 67-58 in two overtimes. Scratch that. Beyond horrific in the first half. In this latest run of the past eight years Pitt has been on, this may be the worst they've played. Sure, the 2004-05 season which ended in a Bradley loss tried my patience. But I can't remember it being this bad. Sloppy turnovers, missed shots, not rebounding, wasn't even the worst of it. It was literally as if players from a Division III school (and not even a good one) inhabited their bodies and showed up in Pitt unis. Not helping out on D, leaving guys open and free to get into the paint seemingly at will, was. Pitt got down by 13 at the half and while I knew Pitt would make a run, I didn't think they would have enough to actually win the game. I've got to say I think I got it wrong on Ashton Gibbs. I believed him to be an upgraded Ronald Ramon, capable of not only jump shooting, but able to penetrate for closer-range shots and even drive to the basket on occasion. While he did that early in the year, he's been not much more than a spot shooter over the past few games. And what's worse is he's struggled in that role. Yes, he's only a sophomore. Yes, teams are not allowing him a lot of open looks. But he's got to be better. Period. The big shots in the 2nd overtime are a nice start. But 3-15 shooting won't cut it. Travon Woodall was abysmal. Somewhere along the line, he thought he could actually hit the short running shot in the lane ala Levance Fields. Someone should tell him he's wrong. Bad shots, poor turnovers, and he never really looked all that comfortable. 33% on free throws for a guard? That's even worse than the poor Pitt free throw shooting we're used to seeing. Gary McGhee, Brad Wannamaker, and Nasir Robinson are the glue holding this team together in the absence of Jermaine Dixon and Gil Brown. All three play with poise and while they (especially McGhee) still make mistakes, they all came ready to play tonight. Wannamaker didn't shoot well, but 10 rebounds? That's huge. I continue to be amazed that Dwight Miller is trotted out there for a few minutes each game. I know he's already redshirted, but man does he look uncomfortable when he gets in. If anyone is a candidate to go after this season to make room for another recruit, it's got to be him. And Chase Adams. I don't even know where to begin. He gets plenty of minutes and doesn't do much with them. Another poor shooting night and a few lazy passes. 3 points, 3 assists, and 2 rebounds doesn't cut it for 28 minutes of play. His minutes are in all likelihood going to seriously get slashed with the return of Dixon - assuming Travon can simply manage games as a PG and not throw them away with poor decisions. Free throws, free throws, free throws. That may have been the biggest game-changer. Pitt shot a whopping 42 while Duquesne only got 14. Both teams shot poorly, right around 50%. You can't get that many free throws and miss that many. Here are a few gems - Woodall=2/6, Robinson=1/6, Taylor=4/8. Inexcusable, but then again, what else is new. 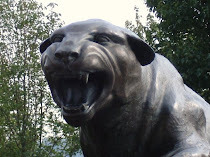 Lastly, Duquesne clearly got rattled when Pitt started their comeback. To lose the ball like the Dukes PG did with absolutely no pressure at the end of regulation was unbelievable. It seemed to spiral out of control after that. With no inside presence after Damian Saunders fouled out, they just couldn't get anything going. Bill Clark was a warrior and the only one who seemingly really wanted the ball. He even took one long range shot where you could just feel that he felt no one else was capable of making a shot at that point in the game. And as bad as Pitt's guard play might have been, Duquesne felt the need to outdo them. Their two starting guards, Eric Evans and Jason Duty shot an astounding 4-25. If you're scoring at home, that's under 20%. That included a 1-13 clip from three-point range. If Duquesne gets even a serviceable game from either, they win. All in all, an exciting game and one definitely worth attending - traffic, mid-week game, and all.